For past few decades, 5 gallon bottled water cooler container has stayed virtually unchanged. Until 2013, CHUMPOWER started experiencing with the concept of compressible bottle. The idea was that as the bottled content being consumed, the lost volume generates vacuum which cause the bottle to collapse. When the bottle is fully consumed, it would also be compressed fully and ready for recycle bin. This offers several advantages over the conventional counterpart. In conventional water cooler, outside air is required to enter into the bottle for water to flow out of cooler properly, however, this would also bring in any germs and bacteria presence in atmosphere and contaminated the water within the bottle. This source of contamination is eliminated when compressible bottle is used, since no air enters into the bottle as the water is being consumed. Also reusable water cooler bottle required to be recovered and going through several stages of washing processes before it can be refilled and back into the distribution channels again. All these expenses associated with reusable bottle can be saved if switched to single-use container. 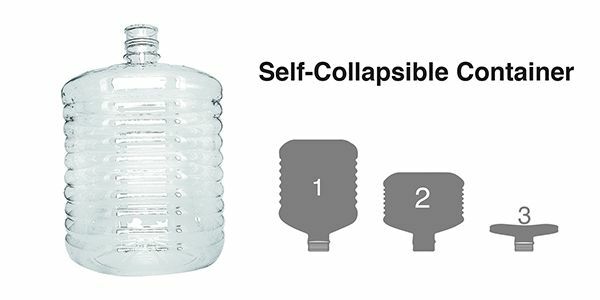 Re-usable water container weights around 700-800g, while single-use container weights around 120g, which in term is a substantial saving in raw material. Therefore advantages for single-serve bulk container are the reduction in raw material, omission of recovery transportation cost and the washing process (alone with the reduction of water and chemicals consumption). Since single-use water cooler system works different from the conventional system. For compressible bottle only, minor modification in water cooler itself is necessary mainly to allow water to travel in one way direction only without allowing atmosphere air re-entering into the system. Also re-usable water cooler bottle weights heavily, so they have high top load rating and stack capability. Single-use compressible bottle is light in weight and designed to collapse on itself with only small internal vacuum force, therefore for transportation purpose each bottle is put into a double-layer cardboard box after it is being filled and attached with a plastic tape handle at the bottom for ease of handling during the change-over at the cooler. For end user with conventional 5 gallon water operation, they don’t have to implement all these changes all at once. In fact, many of CHUMPOWER end user simply switch to light weight single-usage water bottle without the need for bottle to be compressible, the raw materials and cut down cost from water and chemical savings from omission of rewash process are good enough reasons for them to do the switch. Of course, for client who is new to the 5 gallon bottled water sector, they chose to go with light-weight compressible bottle routine for their business operation and enjoyed the market success right away. Regardless of business directions, CHUMPOWER provides solutions for our clients every steps of the way, not only can we provide production equipment that caters to all your needs, our extensive experience can also provide you with the best production consultation. In fact, CHUMPOWER introduced a new PET blow molding machine called L2GM , designed specifically for processing both light-weight bulk containers and single-serve compressible bottles. Since preform weight is down from 800g to 120g, energy-savings are significant comparing to conventional re-usable 5 gallon processing. The machine is 2 cavities capable of output about 1500-1800bph for 12L compressible bottle with preform weight of 120g. All major components are servo driven so processing is stable with high repeatability. Energy consumption is estimated to 66KW/hr. Currently, CHUMPOWER has delivered more than 5 units allocated in Taiwan, Japan, and Turkey for processing both light-weight single-serve bottles and compressible containers.